eLagaan announces special package for getting export code to get your money from Paypal. INDIVIDUALS can also get an export code. As many of you may be aware that PayPal recently announced that all the Business owners need to have an export code to withdraw money (see below). To support our users on this issue we have created a special page for information on IEC (Import Export Code) here. Also noticeable is the detailed IEC FAQ. Here is a small presentation on the subject. View more presentations from eLagaan Income Tax India. "I’m pleased to tell you that the RBI has now allowed us to resume bank withdrawals for settlements for exports of goods and services. We are currently making changes to comply with Indian regulations for settlements for exports of goods and services, and we anticipate that as of Wednesday, March 3rd, we will be able to resume the bank withdrawal service. As part of the changes, you will be required to fill out a new field entitled ‘Export Code’ when you request a withdrawal. This information is required under the current laws of India in order to identify the nature of cross-border merchant transactions. On Monday, March 1st, we will be back in touch with specific instructions on how you can move your money into your bank account. I will be posting another blog then. I’d like to thank the RBI for working with us to get this addressed. We know this is an inconvenience to you and we appreciate your patience. Moving forward, the RBI has told us that PayPal needs specific approvals to allow personal inward remittances to India, which we currently do not have. Until we get these approvals, personal payments into India will remain suspended. However, if you are an exporter, you will continue to be able to use the PayPal service for payments of goods and services. In fact, with the changes we are making to our system, PayPal is now set to be a more powerful engine for exporters in India. With purpose codes for export transactions and FIRCs (Foreign Inward Remittance Certificates), you should now be able to get the export related benefits you seek." 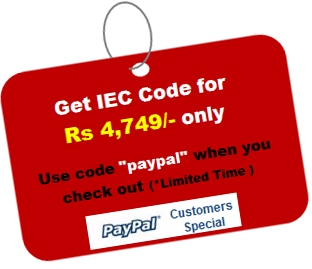 Click here to get your export code for Paypal in just few clicks. For more details on import export code, checkout our IEC page or IEC FAQs.